Eumeka Aguado is a genuine, passionate Realtor whose hardworking and proactive qualities show her ability in helping both buyers and sellers meet their real estate dreams. Eumeka Aguado has held her real estate broker’s license with Wenzel Select Properties Ltd. since January 2017 and is a proud member of the National Association of Realtors, Illinois Association of Realtors, and Mainstreet Organization of Realtors. Eumeka’s education includes a bachelor’s degree in Corporate Communications from Northern Illinois University. 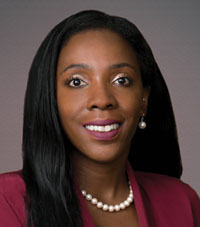 Eumeka can use her experience and insight to proactively guide you through the purchasing and selling of real estate. Eumeka Aguado was born and raised in Elgin and currently resides in Carol Stream with her fiancé Matt and son Kyan. She is also a women’s assistant basketball coach at Elgin Community College located in Elgin, IL.